Have you ever prayed? “God, teach me to hear You.” And then listened, and listened, and listened, and listened, and listened? I have more than once, I might add always with the same results, nothing. “God I can’t hear You, is there something wrong with me?” Which leaves me wondering does hearing God involve more than our 5 senses? Is it possible we really sense God’s presence rather than hearing a voice, do we experience God rather than hear Him? It’s fascinating how we can be thinking and praying for something then suddenly we find ourselves reading a scripture of the same idea. “Hear me as I pray, O Lord. Be merciful and answer me! My heart has heard you say, “Come and talk with me.” And my heart responds, “Lord, I am coming.” (Psalm 27:7–8, NLT) Does the Psalmist provide us with the answer we’re looking for? I am getting the idea we probably should be praying, “God, teach me to experience You.” Rather than, “God, teach me to hear You.” But is there really that much difference between hearing and experiencing? Life has taught me: you can hear and not experience (Patti will tell you how true that is). On the other hand you can experience things and people without hearing, ever witness a beautiful sunset and felt the presence of the Creator? 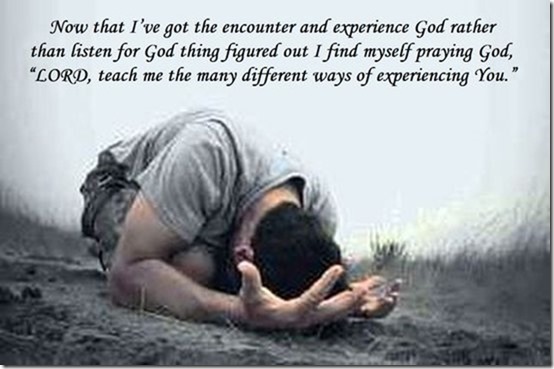 It is my conclusion that it is much more important to experience God rather than straining ourselves to hear Him. It is when we experience God, and accept His plans for our lives rather than our own do we begin to discover how God is working out a solution to our problems.